Segmented tall vase turned from Tasmanian Ash and Jarrah 150 mm in diameter x 300 mm high. I made two bowls from one piece of Tasmanian Ash 1 meter long by 100mm wide by 50mm thick and one piece of Jarrah the same dimensions. 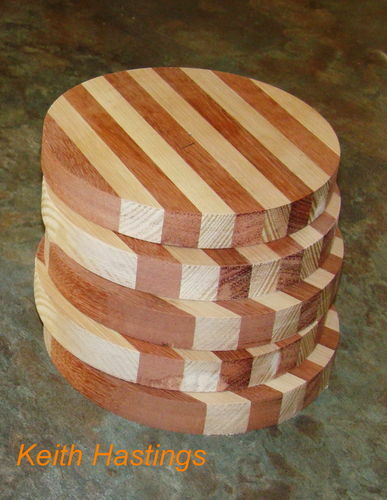 Hi Lew….see photo I parted off rings from these disks and glued them up alternating them to form the bowl then turned it. Great work! Is the inside hollow? nice work as always buddy. WOW…a very good looking vase!! James…..the inside is hollow and the wall thickness is 6mm right down to the bottom of the vase. Very nice work as always! That’s wonderful, Keith. And, look at that, now it’s in my Favorites Folder. Great work Keith, really like the wood choices and the shape of both projects. Well done. Keith . That is a very attractive Vase.